In these days, I am struggling with my own code. The code is not new, and actually it was written several years ago, by myself. I am reading the code as I have a necessity to use it, but it is very difficult. There are several tricky parts for which I cannot remember the necessity. But they seem working, and if I remove those tricks, the results are funny, or the performance becomes poor… Apparently, I was clever. But I cannot understand what I embedded in. Well, I have to read the entire code (which is rather large) and understand all the staffs implemented in. There is no short-cut. Code development is always with such a winding manner, even though I put some short notes in the code… Indeed, the notes are puzzling… I am sure that I was somewhat mad when I coded it. which is an empirical equation describing the relation between viscosity of solutions and the solute concentration. (Of course we could start from the famous Einstein’s relation for viscosity.) Nevertheless, the equation describes the experimental results well, given that the solute concentration is roughly less than 1 mol/L. But for higher concentration it does not work well; the viscosity rapidly increases with increasing solute concentration much more than the equation. The recent paper from UK proposes a convincing explanation, in which the dramatic increase of viscosity can be attributable to structural development of solutes. 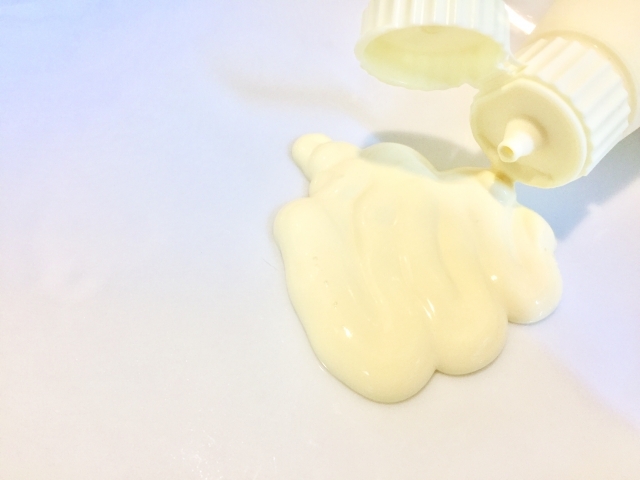 The researcher calls the effect ‘The Mayonnaise Effect’ owing to the fact that there is cell-like structures in mayo, as well-known for rheologists.